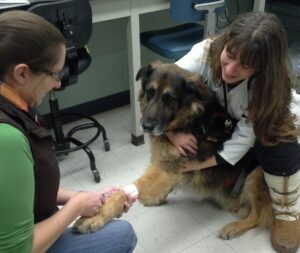 In today's VETgirl blog, we interview Dr. Kristina Kiefer, PhD, Assistant Clinical Professor at University of Minnesota on the use of stem cells for the treatment of osteoarthritis in dogs. Osteoarthritis is a non-reversible disease in which the joint loses cartilage and begins to ossify. This causes pain and therefore lameness. Current therapies involve weight control, pain management (including NSAIDs, tramadol, etc. ), alternative medicine (e.g., acupuncture), and physical therapy. Allogeneic mesenchymal stem cell (ASC) therapy is currently being looked at as a possible treatment for this disease. This involves the collection of mesenchymal stem cells from fat in normal dogs undergoing routine surgeries. Because the cells come from one dog to another, it is considered allogeneic (non-self). The reason stem cell therapy is promising is that these cells are multipotent, or are capable of becoming many types of cells, and anti-inflammatory. In theory, mesenchymal stem cells can differentiate into cartilage. We suspect that allogeneic stem cell therapy will increase healing of joints affected by osteoarthritis and slow down arthritic progression.